A little while back I had some fun and put together a definitive hockey roster made up solely from characters in fictional hockey movies. The rules were pretty simple; Team could only feature players who appeared in a movie that featured hockey and movies based on true stories did not qualify for the roster. 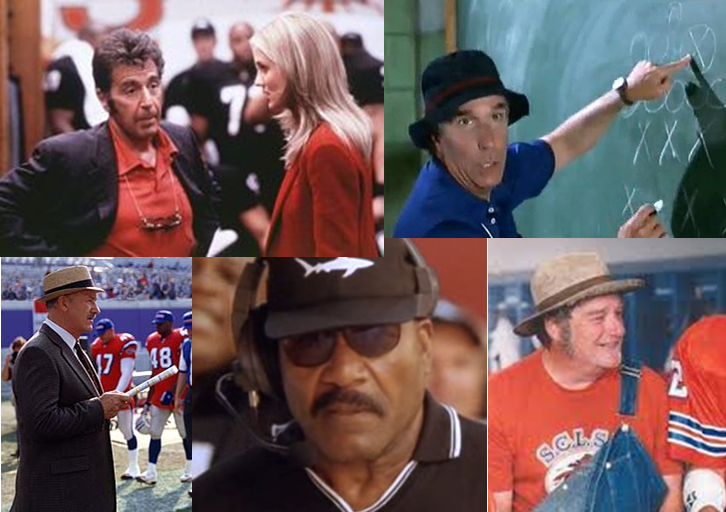 So I decided to follow the same rules and craft a football team roster out of fictional movies. Movies (I also used one TV show) about high school, collegiate and professional teams were considered and each player was evaluated for his play on the field, not the level they played at during each film. Funny enough, most football movies only focus on quarterbacks, running backs, receivers and the middle linebacker. Shocking, I know. Rarely are significant characters written in at other positions. However, I scoured these films and managed to fill an acceptable 22-man roster. There simply wasn’t enough depth at each position to provide backups. So this won’t be a two-deep depth chart but will have a few additional players (WR and DB) to accommodate for subpackages. 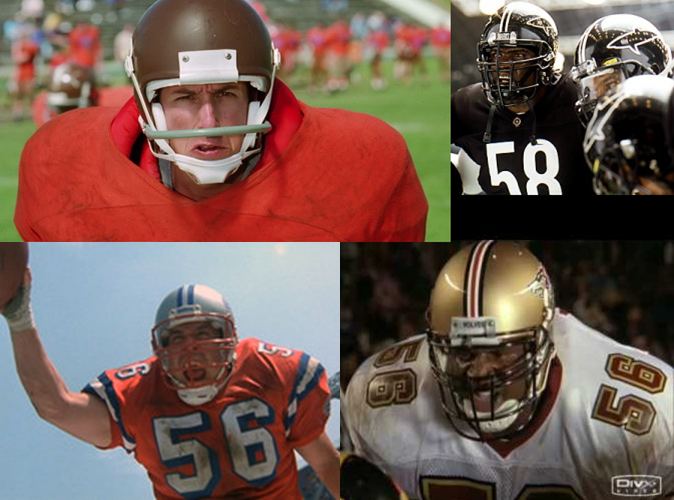 Additionally, I went with a 3-4 defense due to the abundance of talent at the linebacker position in literaly every football movie. Owner: Christina Pagniacci (Any Given Sunday): I’m not much of a Cameron Diaz fan (I think she’s pretty obnoxious) but Pagniacci was willing to do anything to get her team to succeed. That’s the type of trait in an owner I like to see. Deep pockets and looking attractive in yoga pants helps and I’m certain Pagniacci meets all three criteria. GM: Tony D’Amato (Any Given Sunday): This is a promotion for the firey head man from Any Given Sunday. Of all the coaches in football movies I feel like he has the aggressive approach I’d want to see out of my GM. Ensuring he gets along with his owner is another story. Head Coach: Jimmy McGinty (The Replacements): In hindsight, McGinty may actually be a better choice as a GM. He did a hell of a job picking a competitive roster for the Washington Sentinels and I’d imagine he’d be equally adept with a full year of roster management. That being said, he takes a pragmatic approach to the game and gets the most out of his players. A great fit for my team. Offensive Coordinator: Coach Klein (The Waterboy): SCLSU’s Bourbon Bowl victory allowed Klein to find his manhood. It also allowed him to rediscover the offensive genius that penned the magical green notebook that would have made him a shoo-in for the University of Louisiana position all those years back. This type of dynamic thinker is who I want dialing up the offense. Defensive Coordinator: Montezuma Monroe (Any Given Sunday): It’s Jim Brown, c’mon son. The on-field results really spoke for themselves. The Sharks had a hard hitting, aggressive defense. Given the linebacker corps I’ve rostered, I think Monroe will be a great fit. Special Teams: Farmer Fran (The Waterboy): Special teams, go run laps with Farmer Fran. QB: #16 Shane “Footsteps” Falco (The Replacements): His disastrous Sugar Bowl doomed his career beyond Ohio State but the run he took the Washington Sentinels showed that he has the skillset to thrive at the professional level. He’s a natural leader with plenty of moxie and the dude just wins. He’s like a fictional football playing Chris Drury. RB: #33 Wendell Brown (Varsity Blues): A true workhorse back, Brown can be counted on for 25+ carries a game. I’m shocked that he only ended up at Grambling when you consider he was the factor back for a Texas powerhouse program. Brown is a special player who was underutilized by Bud Kilmer. RB: #23 Earl Megget (The Longest Yard): While Brown is the consummate workhorse, Meggett is a pretty special talent. He goes beyond third down back and forms a nice little Thunder and Lightning duo with Brown. In addition, he makes for a perfect kick returner with his blazing speed and outstanding agility. WR: #88 Deacon Moss (The Longest Yard): Michael Irvin. Deacon Moss is Michael Irvin and that’s about all you need to know. He’s an all-around talent who can serve as both a deep threat and underneath possession receiver. He’ll serve well as Falco’s top target. 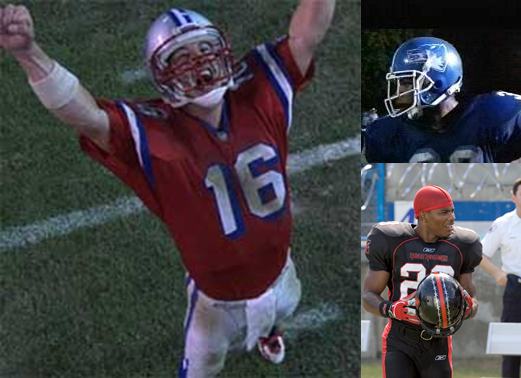 WR: #85 Rod Tidwell (Jerry Maguire): Tidwell proved his worth on Monday Night Football. He will go across the middle and take hits, he’s a physical talent who battles for the ball. A great fit as my number two wide out, he will serve as an excellent complement to Deacon Moss. WR: #82 Charlie Tweeder (Varsity Blues): Tweeder’s drinking issues will need to be kept in check but he’ll be a great fit in the shifty white kid, slot receiver role that Wes Welker has made so popular. WR: #81 Clifford Franklin (The Replacements): Franklin will be the deep threat here. He doesn’t have sure hands and doesn’t run the prettiest routes but he’s a burner who will be tough to track. In four-wide sets he can serve as a threat. 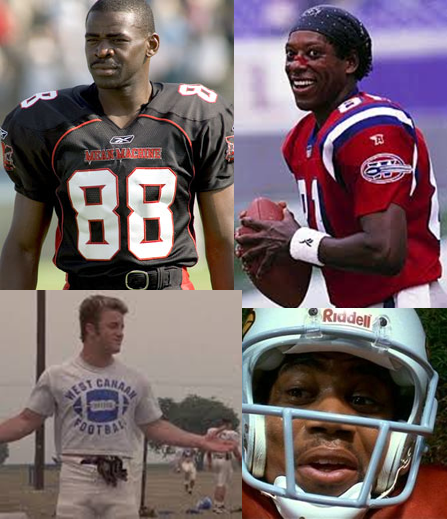 TE: #86 Brian Murphy (The Replacements): If you notice a trend of players from The Replacements it is because it is really the only football movie to consider multiple positions in the script. It’s a very complete roster that happens to include a first-round talent at tight end. Murphy blocks and is an impressive receiving threat. I’d have him slide in as an H-Back in specific running situations if a bigger body blocking back was needed since we don’t have a fullback. LT: #77 Bud Kaminski (The Program): A big, mobile tackle, Kaminski comes from a football factory and served as the primary protector for that school for four years. LG: #69 Billy Bob (Varsity Blues): Billy Bob is a road grader. He’s a massive human who plays an effective game. He’s consistent and can bring a steady presence to the left side of the line. C: #72 Jamal Jackson (The Replacements): One half of the brotherly connection on this line will play in a slightly new position so that he and his brother can be alongside one another. Rather than putting the two Jackson’s at guard, I’ll have Jamal centering my line. RG: #73 Andre Jackson (The Replacements): Jackson brother number two is a mobile guard who will be terrific pulling out on screens and outside running plays. Jamal might be the more outgoing brother but I feel that Andre is more talented. RT: #60 Kelvin “The Buffalo” James (Playmakers): James was the do-everything tackle on ESPN’s short-lived series Playmakers. He’s an ultra-talented tackle and will be a great fit as the other bookend with Kaminski. CB: #24 Stefan Djordjevic (All the Right Moves): A bit undersize, Djordjevic is a supremely talented defensive back who can take over a game. He may not be Revis Island, but I’d be confident matching him up with any team’s top wideout. Number Note: Since Wendell Brown is rocking Djordjevic’s double threes, I bumped Djordjevic down into the 20s. CB: #43 Ray Barnes (Playmakers): Another TV show cheat to help fill out my defensive backfield. Barnes is a steady veteran presence who will be a great asset opposite more of an explosive playmaker like Djordjevic. Factor in Earl Wilkinson at free safety and the coverage game here will be fine. SS: #29 Cheeseburger Eddie (The Longest Yard): Eddie served in an offensive role in the 2005 remake of The Longest Yard but he is a physical specimen (despite his diet) and I don’t think he would struggle to make the switch to the defensive side of the ball. Playing him as an in-the-box strong safety would help utilize that big frame. Number Note: Eddie wears 89 in the 2005 remake of The Longest Yard and that doesn’t necessarily translate to a great defensive back number. So I kept the nine and dropped him down to the 20s. FS: #42 Earl Wilkinson (The Replacements): Since there are already a few ex-cons on my team, I’m not too worried about the background of my players. With a guy like Jimmy McGinty as my coach I know discipline will be a big deal in the locker room. Wilkinson could probably play corner too, if necessary. That makes him a very dangerous talent. Plus he wears that badass tinted visor, you can’t lose there. Nickel Back: #21 Guard Papajohn (The Longest Yard): A member of the Guards superteam will step in for subpackages to offer a little more speed and coverage ability on the outside. He can either slot in as a nickel safety with Wilkinson sliding to the slot man or Papajohn can serve as the coverage guy himself. OLB: #59 Bobby Boucher (The Waterboy): The neck roll, the squealing, the devastating, injury inducing hits. Bobby Boucher is the single most devastating linebacker on the field at all times. He holds the NCAA record for sacks in a single game and can single-handedly shut down an offense with little or no help. He will be the cornerstone of this defense. I have him playing slightly out of position here simply because he plays with such intensity that you can remove him from the point of attack and not have to worry about his numbers dwindling. Number Note: If this was a college team I’d have no problem with Bobby keeping number nine. However since this is a pro team and the NFL has ridiculous number restrictions, I’ll give Bobby 59 which is a perfectly acceptable number for a linebacker. ILB: #56 Alvin Mack (The Program): Mack is a crazy talent pro prospect cast in the mold of Ray Lewis during his days at ESU. He covers a lot of field and is a tackling machine. He exhibits strong football IQ and would serve well as the defensive captain on my team. I also include him because I’m confident that he’d be capable of bouncing outside to take on blockers while allowing Boucher to play at the point of attack. ILB: #55 Danny Bateman (The Replacements): He’s got a high motor and isn’t afraid to punish players in the run or pass game. Bateman is a solid interior linebacker who will fill responsibilities and play a steady game. He and Mack should form a nice solid duo that will let Lavay and Boucher weak havoc on the outside. Number Note: Bateman wore #56 for Washington but will surrender the number to the defensive captain here. Besides, 55 is such a solid linebacker number. OLB: #58 Luther “Shark” Lavay (Any Given Sunday): The heart and soul of the Miami Sharks’ defense, Lavay is a prototypical pass rusher from an odd front. Like his other outside linebacker companion, Lavay bears a striking resemblance to a legendary pass rusher from the NFL. Number Note: For some reason I thought Lavay wore LT’s number 56 with pride. Turns out I was wrong and he wore 58 in the movie. Oh well. DE: #92 Meaney (The Waterboy): Meaney was a big, strong defensive tackle at UL and shouldn’t have too much trouble playing closer to the outside in the odd front that I’m setting up. With Lampert and Lavay (aka Romanowski and Taylor) as the outside backers, the rush skillset of my linemen won’t be too important. Number Note: Jamal Jackson has claim to #72 which is the number Meaney wore at UL. Having him wear 92 isn’t too large of a deviation from his original number. NT: #94 Turley (The Longest Yard): Turley played a little bit of offense and defense in The Longester Yard, but his stunning size would make him a great tackle in my defensive scheme. He isn’t a prototypical nose tackle in terms of body shape, but he’s so massive that he’d still be incredibly difficult to control at the line. Number Note: Turley wore 44 in The Longest Yard but I’ll bump it up to the 90s for his permanent move to defense. DE: #99 Steve Lattimer (The Program): Perhaps he was a roided out nut bar during his time at ESU which could be a problem for keeping him on the field. Of course, being a roided our nutbar made him a very effective defensive lineman. He also rocks some truly incredible face paint. K: #3 Nigel “The Leg” Gruff (The Replacements): The Leg has serious range and would probably only be challenge by the Field Goal Kicking Philadelphia Phenomenon. Gruff seems like he’s better in the clutch (so long as he doesn’t owe anyone money) and could be counted on for big, game winning kicks. P: #4 Derek Wallace (The Waterboy): Considering Wallace was the only person running with Farmer Fran, I gathered that he handles kicking and punting duties. He has a solid leg and is the only guy in any movies that I could find with punting experience. Plus, he could fill in as the placekicker if Gruff was injured. Number Note: Both he and Gruff wear three; I just bumped him up one digit. No Forest Gump? All-American return man. Gump was definitely a snub. With his athleticism, toughness, and unselfishness, he would also be a core special teamer. Turley isn’t even the best nose in his own movie. Switowski is a better fit for that position. I never saw Turley on defense in that movie, and even if his height didn’t render him completely ineffective at the nose position (it would), his utter lack of mobility would. Turley has no lateral quickness to string out the play, so teams could just run sprints and stretches toward the sideline, and if the edge out there isn’t sealed, the back can cut it up inside for 5-10 yards since Turley wouldn’t be there to stop him. A conventional 3-4 makes the nose the first line of defense against the cutback, and as much as I love Montezuma Monroe, he’s not going to be running anything unconventional. He’s a motivator who runs a good practice and stresses execution, not an innovator. Switowski is even a little tall for a nose tackle, but he still has plenty of strength to deal with double-teams, and he has the mobility to execute his assignments on the field. Plus, Switowski played D-line in the film, and it’s easier to project a 350-lb+ end to nose tackle than a 7-foot fullback. I also think you have your offensive line backwards. Buff (an NFL left tackle) and Jackson (the better pulling guard) should play on the left side, where they see the best pass rushers and the most pulling assignments, respectively. Bud-Lite (a college right tackle who was shown to have some difficulties in pass protection) and the massive but immobile Billy Bob fit better on the right side, where their first responsibility is to move the line of scrimmage on running plays. Billy Bob is enormous and ESU ran most of their plays to the right side with no missed assignments from Bud-Lite. Actually, given Billy Bob’s physical limitations, I might make him the center and leave my two All-Pro guards at guard, but since Billy Bob might not be smart enough to play center, putting one of the Jackson’s there isn’t a terrible choice. Also, a minor disagreement: I would move Wilkinson to one of the outside spots in the nickel and put Djordjevic in the slot in nickel situations. On 3rd downs, the slot receiver is usually the primary option these days, and Djordjevic has the right skillset for chasing slot receivers and breaking up passes to prevent conversions. His lack of size isn’t a factor at all in the middle of the field, where the QB is trying to keep the ball down anyway. Wilkinson and Ray Barnes (awesome job finding him, by the way!) have the size you want on the outside to defend out routes, fade routes and back-shoulder throws along the sideline, where the QB is going to be throwing high. I do think you have the right arrangement with D’Amato at GM and McGinty as the head coach. D’Amato is too old-fashioned and hidebound to let Coach Klein run his offense. McGinty wouldn’t care if it’s unconventional as long as it worked. The head coach definitely gets a lot of say in the draft room, so McGinty’s eye for talent wouldn’t be wasted there. Plus D’Amato actually accepts a job where he’s the head coach and GM at the end of the movie, so that promotion is true to the film. How about “Left Side…Strong Side” Julius Campbell and Gary Bertier (Remember the Titans). Wouldn’t be mad at coach Boone nabbing the head job either. I built the roster (and the hockey one too) based off fictional movies. Which meant I had to rule out players from films based on true stories. 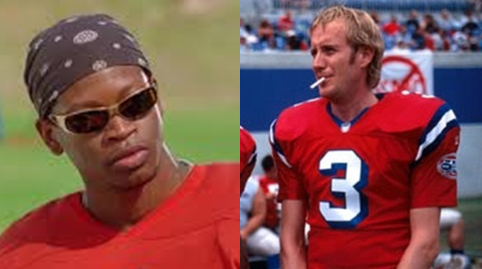 The two guys in Remember the Titans were easily on top of my list until I remembered it was a movie based on a true story. Which is why I left those two off. As for Gideon’s breaakdown…I can’t begin to disagree with any of what he said. I could easily swap alot of those guys in and out of various positions as need be and his point about Turley is a valid one. Glad so many people are getting involved in the discussion on this, that was the idea behind doing it.